Learn how to fill out Form 12.901b3, Petition for Dissolution of Marriage With No Dependent or Minor Children or Property, with our do-it-yourself step by step instructions and helpful explanations. 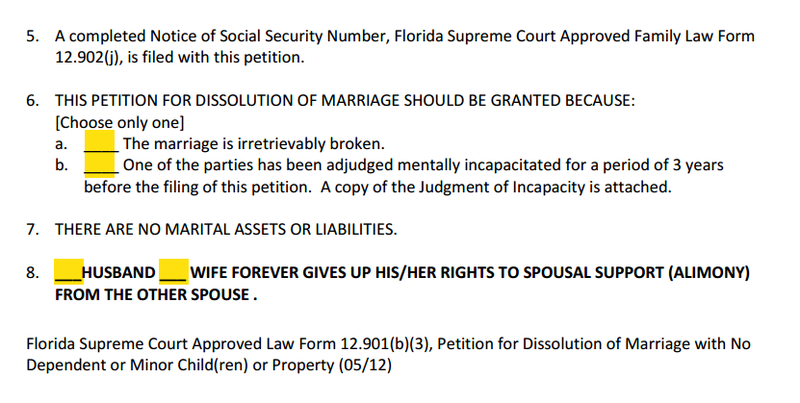 For those who do not qualify for the Simplified Divorce, Florida's regular Divorce No Children and No Property Procedure starts with this petition... Florida Family Law Rules of Procedure Form 12.901(b)(3). Relying on years of experience helping Pro Se filers fill out these forms, we make these instructions simple to follow and easy to use. 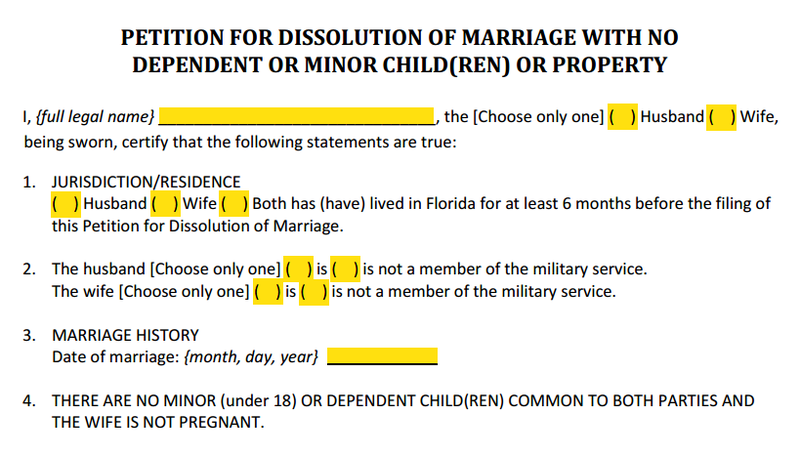 Most people filing for a Florida Divorce with No Children or Property will be able to fill out all their forms by using just this page as their guide. So your first instruction is to... bookmark this page! Ready to begin? Great, just download the form and open it in a new tab or window. Properly formatted and fillable online, our interactive fillable PDF forms are the same forms we use for our Documents Preparation Service clients. You will need to satisfy the filing requirements in order to use this form. The first page of this forms' instructions state when you can use Form 12.901b3. Neither of you are asking for alimony. If you meet the requirements above, you may still qualify for the Simplified Divorce if you agree on all issues and can attend a final hearing together. For more information, see our Simplified Divorce Form page (see box below) to see if you qualify for this procedure. If you do not meet any one or more of these requirements, you may still be able to use one of the other petitions for divorce. You do not qualify for this divorce form? If you don't have children together and the wife is not pregnant, you can file for divorce using one of these other divorce petitions. 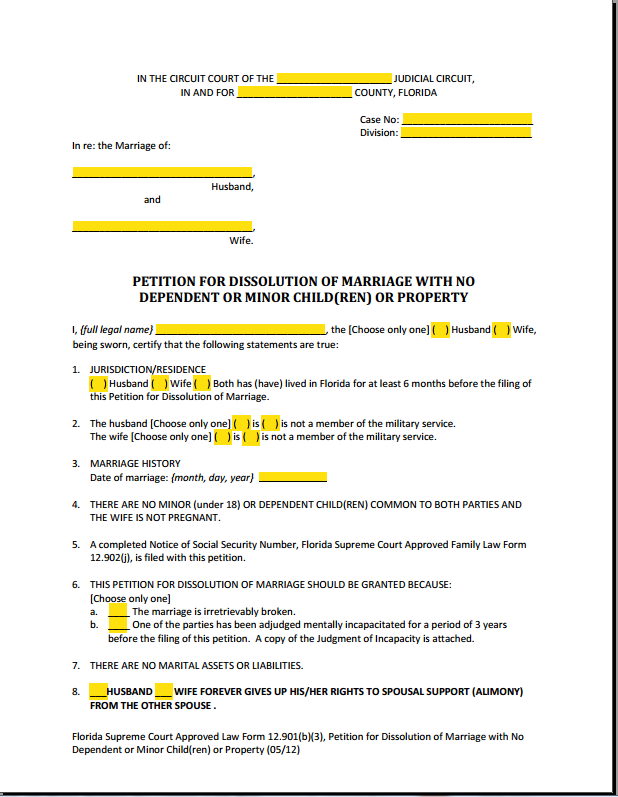 This is the divorce form I need, now what? The easiest way to get your forms filled out correctly and efficiently is to start with the petition first. We recommend having copies of the supporting forms you will need to file with your petition handy. See the box at the bottom of this page for the list of these forms. You can download the supporting forms from there. Fill out the top portion of the form, known as the style, caption, or heading. The heading should be the same for all the supporting forms as well. The county is the county where you file with the Clerk of the Court. Usually this is the county where at least one of you currently live. The circuit is the judicial circuit of the county you are filing your paperwork. To find out which judicial circuit your county is in, you can check here. The case number and division should be left blank for the clerk to assign. 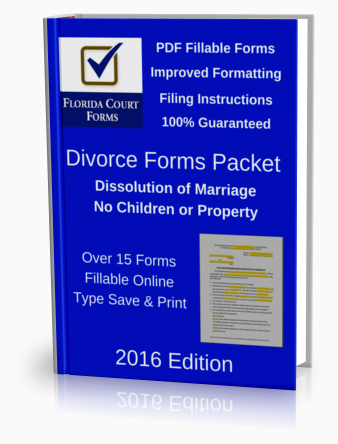 Once the divorce papers are filed and the case number is assigned, all the supporting forms should have the case number and division filled out the same way. Most of the paragraphs (symbolized here with ¶) are self explanatory. However, some parts of these forms can be confusing. Where appropriate, we try to clear this up. 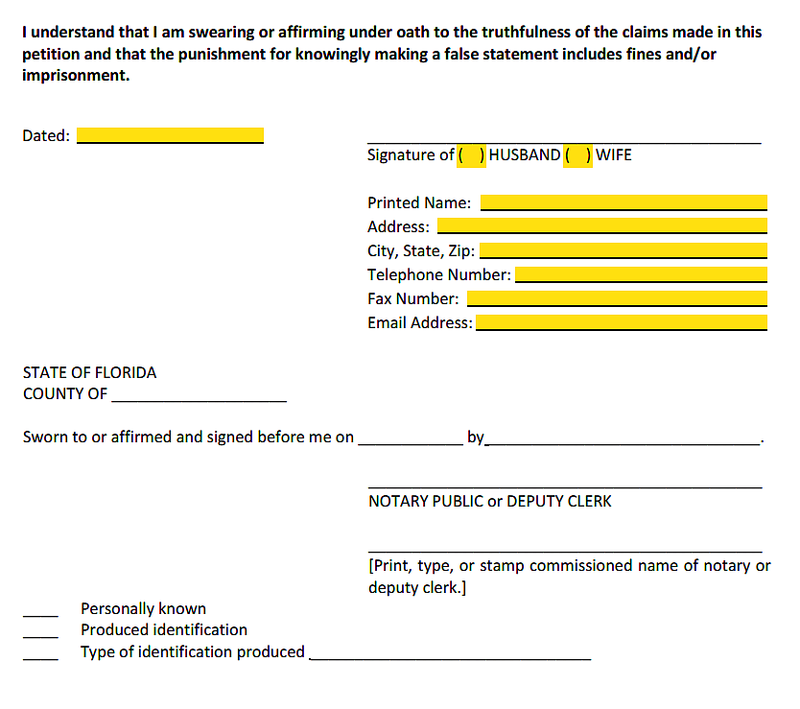 Type in your full legal name as you did in the husband/wife section above and check the appropriate box. ¶ 1. This is the residency requirement. Check the box that applies. ¶ 2. Military service includes active reserves. Retired military does not count as active. Check the boxes that apply. ¶ 3. This is the marriage declaration. Write the date you were married. ¶ 4. Statement that there are no minor or dependent children common to the marriage. ¶ 5. Your Notice of Social Security Number is filed with the Petition. You can download this form from the supporting forms box at the end of this page. ¶ 6. This is the grounds for divorce requirement. Check the box if you believe the marriage cannot be saved (irretrievably broken). Or check the box if the grounds are for mental incapacitation with adjudication over 3 years. ¶ 7. Statement claiming that there are no marital assets or debts to be divided. ¶ 8. Statement that you are not seeking alimony. Check your box here, either husband or wife. ¶ 9. If you are the wife and you want your legal name to be changed back to your maiden or previous name, check the box and fill out the full legal name portion. ¶ 10. If there is a request you would like the court to order as part of the final judgment, this is where you would enter it. Check your box for either husband or wife requesting that the court end the marriage. ¶ 1. Check the box here if you are the wife and requesting your name be changed back to your former name. ¶ 2. Check this box if you asked the court to consider an other request in paragraph 10 above. Fill out your name and address but DO NOT sign until you are in the clerks office filing your paperwork. The deputy clerk will witness your signature for a fee. TIP: You can save a few dollars by having your documents notarized by your local bank. Many banks offer free or minimal cost notary services for their account holders. After completing Form 12.901(b)(3), you will need to fill out the supporting forms as well. At a bare minimum you must file your Notice of Social Security and the Civil Cover Sheet. A Marital Settlement Agreement is not necessary for this divorce form as you have no assets and debts to divide. If you can, you should also complete your Financial Affidavit and the Mandatory Disclosure forms. Always make copies for your records. NOTE: Do Not sign the forms until you are at the clerk of the court filing your papers or having them notarized. Your signatures must be witnessed by the deputy clerk or a Notary Public. Bring all of your completed forms to the clerk of the circuit court in the county where you live. For a listing of the circuit courts, their locations, and contact info click here. You must also bring valid ID with proof of residency for the past 6 months. If your ID is less than 6 months old, you may need to bring some other proof of residency. If you cannot satisfy the 6 month residency requirement, you will need to bring an Affidavit of Corroborating Witness signed and notarized. Download this form for more information. You will need to pay the filing fee to the clerk of the court when you file your paperwork. In most circuits the Filing Fee is $409. The fees vary slightly from circuit to circuit and even by county. Call the clerks office in your county to find out the current fee. If you think you may qualify for a fee waiver, you will need to fill out and file the Application for Civil Indigent. Some circuits have payment plans. The clerk will determine your eligibility. After all your papers have been filed, the filing fees paid, you will need to have the divorce papers served on your spouse. This is called Process of Service. Uncontested? If this is an uncontested divorce, your spouse can file the Answer and Waiver and Request for Copy of Final Judgment along with his or her Notice of Social Security forms. Your divorce petition and the supporting forms must be properly served on your spouse. If you know where he or she lives, you will need to have the papers delivered by the sheriff in the county where he or she lives. This is called Personal Service. If you do not know where they are currently living, you may need to use the process called Constructive Service. If your spouse is willing to sign a waiver of process form, they may save the embarrassment of having the sheriff show up at their door or place of work. We have a fully fillable Waiver of Process form for instant download for $2.00 • Buy Now. For your divorce case to proceed, you must properly notify your spouse. If you know where he or she lives, you should use personal service. If you absolutely do not know where he or she lives, you may use constructive service. You may also be able to use constructive service if your spouse resides in another state or country. However, if constructive service is used, other than granting a divorce, the court may only grant limited relief. For more information on constructive service, see Notice of Action for Dissolution of Marriage, Family Law Form 12.913(a)(1), and Affidavit of Diligent Search and Inquiry, Form 12.913(b). If your spouse is in the military service of the United States, additional steps for service may be required. See, for example, Memorandum for Certificate of Military Service, Family Law Form 12.912(a). The law regarding constructive service and service on an individual in the military service is very complex and you may wish to consult an attorney regarding these issues. If personal service is used, the respondent has 20 days to answer after being served with your divorce petition. After all your papers have been filed, the filing fees paid, and your spouse has been served, you will need to contact the clerk again after 20 days to see if an answer has been filed by your spouse. Follow the Case Progression Instructions in the box below. TIP: If your case is uncontested, have your spouse sign and notarize the Answer, Waiver, and Request for Copy of Final Judgment of Dissolution of Marriage Form 12.903(a) and their Notice of Social Security Number forms. Bring these to the clerk of court to file with your petition. DEFAULT... If after 20 days, your spouse has not filed an answer to your divorce petiton, you may file a Motion for Default, Family Law Form 12.922(a), with the clerk of court. Then, if you have filed all of the required supporting divorce papers, you may call the clerk, family law intake staff, or judicial assistant to set a final hearing. You must notify your spouse of the hearing by using a Notice of Hearing (General), Family Law Form 12.923, or other appropriate notice of hearing form. UNCONTESTED... If your spouse files an answer that agrees with everything in your divorce petition or an answer and waiver, and you have complied with mandatory disclosure and filed all of the required papers, you may call the clerk, family law intake staff, or judicial assistant to set a final hearing. You must notify your spouse of the hearing by using a Notice of Hearing (General), Form 12.923. CONTESTED... 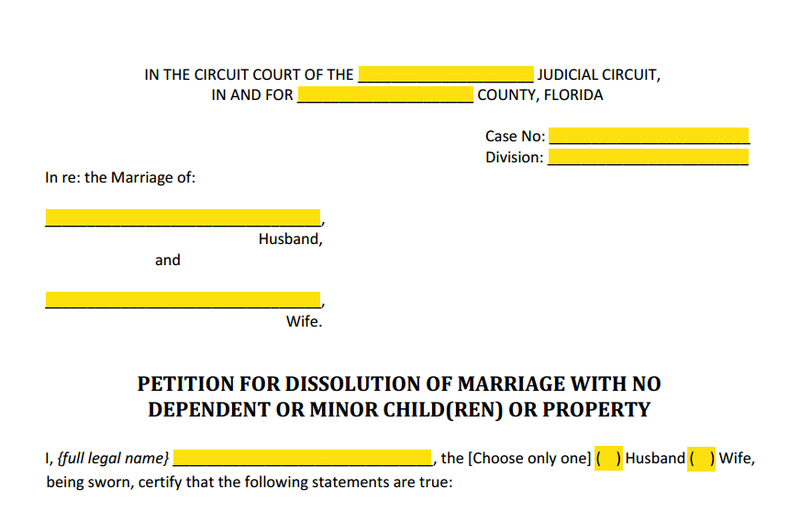 If your spouse files an answer or an answer and counterpetition, which disagrees with or denies anything in your divorce petition, and you are unable to settle the disputed issues, you should file a Notice for Trial, Form 12.924, after you have complied with mandatory disclosure and filed all of the required Florida divorce papers. Some circuits may require the completion of mediation before a final hearing may be set. You should contact the clerk, family law intake staff, or judicial assistant for instructions on how to set your case for trial (final hearing). If your spouse files an answer and counterpetition, you should answer the counterpetition within 20 days using an Answer to Counterpetition, Form 12.903(d). You should check with the clerk, family law intake staff, or judicial assistant to see if you need to bring a final judgment with you to the hearing. If so, you should type or print the heading, including the circuit, county, case number, division, and the parties’ names, and leave the rest blank for the judge to complete at your hearing or trial. For more information about Florida's divorce with children, see chapter 61, Florida Statutes. NOTE: Many of these forms are not PDF fillable. You will need to print them out and write in the blanks with a black pen. Instead, you can purchase these forms in PDF fillable format individually. Fill them out on your computer and then print. 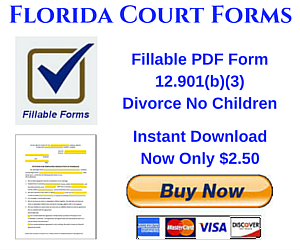 See our Premium PDF fillable forms for sale on our Family Law Forms page. Supreme Court Approved form 12.901(b)(3) Petition for Dissolution of Marriage with no Dependent or Minor Children or Property. Improved formatting with properly sized blank fields and PDF fillable.